The Poltavka culture (ca. 2800–2200 BC), known almost exclusively through its graves, presents a tradition quite similar to Yamna, but with a distinctive style of pottery, and changes in the shape of the grave pit, in details of the mortuary rituals, and in metal tools and weapon styles (Figure 38). Poltavka cemeteries appear in the same geographic region as the north-eastern group of the early Yamna culture. In the Don–Volga steppes, it overlaps with the Catacomb culture, and its graves there show side chambers—shallow hollows undercut into the side of the grave—equivalent to (although clearly distinct from) Catacomb graves. Five Catacomb-style graves have been found in the Samara Valley, as early as ca. 2750 BC, always as isolated additions to earlier kurgans, suggesting contact and exchange between regions on both sides of the Volga. Most kurgans involved the body placed in a single chamber, with a wide step, beneath a kurgan surrounded by a circular ditch, and graves contained usually an adult male, although adult female central burials have also been found (Kuznetsov and Mochalov 2016; Murphy and Khokhlov 2016). A coetaneous culture overlapping geographically with Poltavka is the Vol’sko-Lbishche group, with sites on the elevated, forested height west of the Volga, later appearing in Samara. Of the twelve known MBA settlements and seasonal camps in Samara, eight contained Abashevo materials (see §VIII.15.1. Abashevo), while 3 showed Vol’sko-Lbishche pottery. Only two, overlapping with the latter, showed Poltavka pottery, which was 10 times lower in artefact density than succeeding Srubna materials, all of which supports the higher mobility of Poltavka seasonal camps (Kuznetsov and Mochalov 2016). Figure 38. Materials of the late (Poltavka) stage of the Yamna culture in the Volga-Ural region: 1-4 - Orenburg Cis-Urals (Morgunova et al., 2010); 5–7 - Samara Volga region (Vasiliev et al, 2000); 8-11 - The golden kound in the Lower Volga Region (A Passage, 2009). From Morgunova (2014). Poltavka continues the previous Don–Volga–Ural tradition of predominant sheep-herding economy. Tin from Irtysh sources is found in Troy IIg (ca. 2300–2200 BC), which points to an international east–west trade network in tin across the steppes, and to the connection of Poltavka with Trans-Uralian cultures. In the southern Ural steppes, an intermediate variant called the Tamar-Utkul type has been defined, also called pre-Ural variant of the Late Yamna culture (Bogdanov 2004). Pastoral economy and kurgan burial rituals show continuity with early Yamna. Most Yamna burials west of the Black Sea have radiocarbon dates ca. 2880–2580 BC. Only a small proportion of sites at the Lower Danube shows later dates, with a dilution of the wider Pit–Grave phenomenon. This third stage of pit–graves shows a re-appearance of individuals buried contracted to the side or in extended body position as secondary burials in the mounds, perhaps under the influence of the Catacomb Grave culture or further to the east, or locally at the Lower Danube (Frînculeasa, Preda, and Heyd 2015). By 2500 BC, Yamna is already on the decline, and is gradually transforming everywhere ca. 2600–2400 into the Catacomb Grave culture, while losing grip of settlements in the western Pontic area and retreating thus to its north Pontic core zone. It is hypothesized that the reduction in winter precipitations and an increase in precipitation during the warm season may have caused the increase in productivity of phytocenoses providing more favourable conditions for early cattle breeders, explaining the bloom of the Catacomb culture in the desert steppes (Khomutova et al. 2019). The Catacomb culture (ca. 2500–1950 BC) is centred on the Dnieper–Azov–Don–Caspian steppes, starting thus during the emergence of the European Early Bronze Age, marking the shift of the centre of gravity from the east-central European lowlands (with west Yamna settlers) to western Europe (with Bell Beakers) and to the Aegean. Methodological problems make it difficult to distinguish late Yamna from Catacomb burials in the Prut, Carpathian, and Danube areas up to the East Thracian Plain, but it seems established that the culture was centred on the north-west Pontic steppes, with less frequent and intensive infiltrations on the Danube than the previous Yamna culture (Frînculeasa, Preda, and Heyd 2015). The earliest finds appeared in the area between the Don, Volga, and Caucasus foothills during the late Yamna stage, which is compatible with the burial ritual featuring prominently north Pontic and Kuban tradition of wagon burials, representing members of the social elite. The standard burials are catacomb grave complexes—kurgans with an entrance shaft and burial niches in its side walls—with the dead buried in both crouched and supine positions. The aridity of the previous period continues, as do the seasonal camps with tent-like shelters in the steppe, supporting their cattle-breeding economy. Part of their population probably remained behind in permanent river settlements, engaging in agriculture and pit-breeding, and with scattered complex fortifications and communal grave buildings showing a more complex organisation (Parzinger 2013). Figure 39. 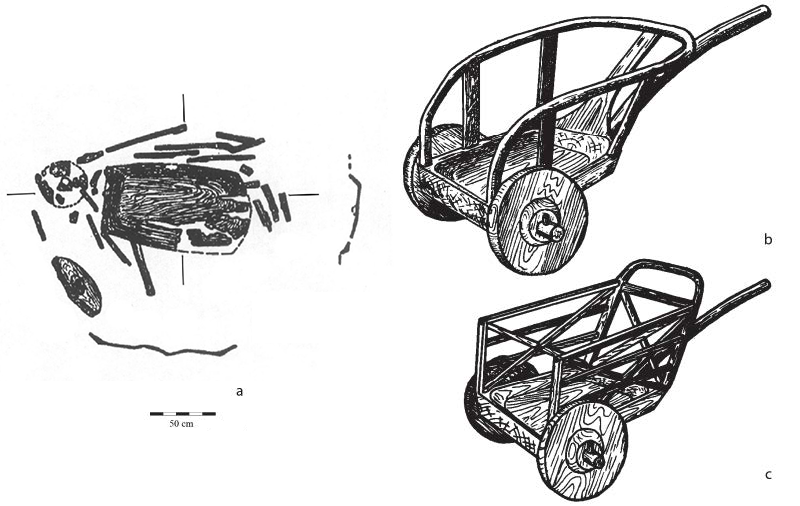 Two-wheeled wagon from burial 27 of the kurgan Tyagunova Mogila (a) and two reconstruction proposals (b–c), by Cherednichenko and Pustovalov (1991), modified from (Pustovalov 2000). The first two-wheeled vehicles appear in the Black Sea region in Tyagunova Mogila (Figure 39) and Bolshoi Ipatovskyi Kurgan. Both carts are small (diameter up to 60 cm), single-piece disk wheels with an integral nave independently rotating on the axle, and can thus be seen as forerunners of an actual chariot, similar to the vehicles known in the Near East at this time. While the role of the domestic horse in the economy is unclear, there is a clear presence of horses as ritual offerings in burials, suggesting their great social importance (Chechushkov and Epimakhov 2018). Its subsistence economy, communication, mobility, and exchange patterns are altered for major parts of the population, although a continuous presence of steppe-related settlements is seen in the Lower Danube and Dobruja regions. The rise of metallurgy and the relevance of craftsmen associated with the Early Bronze Age, which began during the Yamna period, acquires probably its full meaning and greatest extent during the Catacomb period, judging by the number of metallurgists’ graves in the region during the 3rd millennium, in what has been identified as the Inhul–Donets Early Bronze Age Civilisation (Klochko 2013). Common bronze artefacts are slender shaft–hole axes, adzes, chisels, daggers with flanged hilts, and different blades, as well as little spirals, beads, and hair rings. Present are also stone clubheads and flint spears and arrowheads. Pottery shows local differences, as in the previous Yamna period, but some cross-regional styles can be distinguished, such as pots with funnel or cylinder necks, deep bowls with short rims, and incense burners (Parzinger 2013). Investigated samples from the steppe include six individuals of the Poltavka culture in the Samara region (ca. 2900–2200 BC), seven of the North Caucasus culture (ca. 2800–2500 BC)—in the piedmont steppe of the central northern Caucasus—and six from the Catacomb culture in the Kuban, Caspian, and piedmont steppes (ca. 2600–2200 BC), almost all showing continuation of the typical Steppe ancestry profile of Yamna. In contrast to Poltavka, which shows low EFF contribution (ca. 9%, i.e. between Yamna Kalmykia, of ca. 5%, and Yamna Samara, of ca. 12%), Catacomb shows a slightly higher mean EEF contribution (ca. 17%), with some individuals clearly shifted towards Yamna samples from the North Caucasus and towards Maikop outliers (showing a similar EEF ancestry), which is compatible with genetic continuity in the same territory. All samples with reported Y-chromosome haplogroup (five Poltavka, five North Caucasus, three Catacomb) show R1b1a1b1-L23, and among them two R1b1a1b1a-Z2103 lineages are confirmed in Poltavka; four in North Caucasus, two of them R1b1a1b1b3a-Z2109 positive for Y20993 (TMRCA ca. 2800 BC), a subclade of KMS67 (formed ca. 3500 BC, TMRCA ca. 3300 BC), which was found earlier in a Yamna individual from the Samara region; and another R1b1a1b1b3a-Z2109 (formed ca. 3500 BC, TMRCA ca. 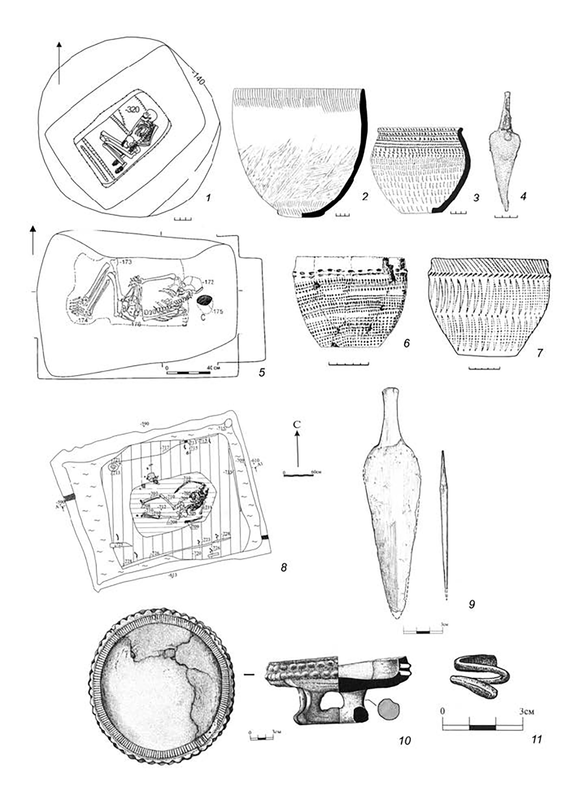 3500 BC) among Catacomb samples (Mathieson et al. 2015; Haak et al. 2015; Wang et al. 2019). One sample without a clear cultural adscription from Stalingrad Quarry (ca. 2680 BC) also belongs to hg. R1b1a1b1a-Z2103 (Allentoft et al. 2015). A sample from Deriïvka (ca. 2900–2700 BC), also of R1b1a1b1a-Z2103 subclade, classified as Late Neolithic (without background information), is a clear outlier, clustering closely with north Pontic Neolithic samples, with contributions of Steppe and NWAN ancestry (Mathieson et al. 2018). This recent admixture of a typical Yamna lineage in the forest-steppe of the north Pontic area—the sample belonging thus probably to the late Yamna or early Catacomb culture—may suggest either the survival of small pockets of local populations among expanding Yamna clans, or an admixture with neighbouring northern peoples from the forest area which expanded to the south. The latter would be justified by the intense contacts of the late Yamna/Catacomb culture with the Middle and Upper Dnieper, evidenced by parallelisms in material culture of Catacomb with the Middle Dnieper culture (Klochko and Kośko 2009). A Poltavka outlier from the Sok River in Samara (ca. 2900–2500 BC) clusters closely with Central European samples of the Corded Ware culture, and shows hg. R1a1a1b2a-Z94 (formed ca. 2700 BC, TMRCA ca. 2700 BC), a subclade of R1a1a1b2-Z93, widely distributed in the subsequent period in the steppes and Central Asia (Mathieson et al. 2015). This grave was most likely established on top of an older Poltavka cemetery, where a Sintashta cemetery was later found. Nevertheless, assuming the date is correct, it would be the first genetic proof of the intense interaction and admixture in the Volga–Ural region leading to the Sintashta culture, between Abashevo in the forest-steppe area and Poltavka peoples in the steppes. This close interaction with a Uralic-speaking culture makes Poltavka the most likely representative of a Pre-Proto-Indo-Iranian-speaking community.